BVDF homecare transport service for clients to and from their home. 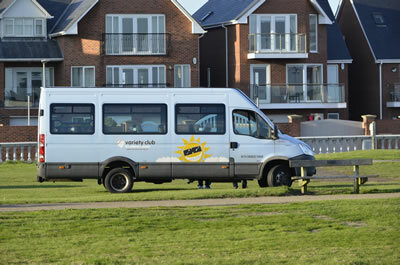 Blyth Valley Disabled Forum operates a transport service. This is operational seven days per week, transporting the elderly, frail and disabled clients of all ages to social outings, recreational activities group meetings and church services. Our other user groups include local sheltered accommodation complexes who often book out our transport and drivers for shopping trips to the metro centre, Sunderland and Middlesbrough but to name a few. Other popular destinations have been Beamish living history museum, Bamburgh castle, Seahouses and Amble providing a valuable service to the local residents of Blyth Valley. The vehicles are also used to transport children and adults with special needs to Blyth sports centre where they participate in sports and leisure activities. If your organisation has any transport needs or your group or association would like to take the golden opportunity of having a social trip or outing then do not hesitate in booking one of our 16 seater fully accessible vehicles with a highly trained driver. Prices start from £55 for the first thirty miles of travel then £1 per mile thereafter. Day tripper Minibus Travel - Click here for more information.